I know it's late, hopefully someone else reading this finds this helpful - the digitizer cable on my screen was slightly tucked under the display, on the inside-facing side of the replacement front screen. When I put everything together, it didn't reach, so I gently tugged on it. Welp, it tore. 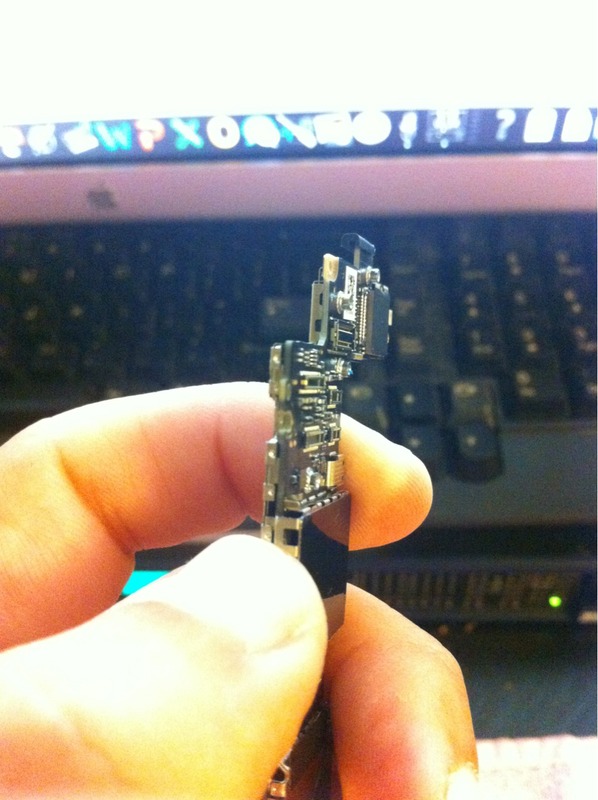 Took it apart to find out what I did wrong, and I was able to carefully unfold the digitizer cable from the LCD. Had I been patient and disassembled the phone and worked the digitizer cable until it came out, I would have had it fixed. Go slow, be careful, don't shy away from backing up a few steps if you need to make sure it's right! The screw that holds the wifi connector on is wrong in half these pics. There are two screws. The base screw which goes on before putting the grounding clip in and then another top screw. Step six has it wrong and a few steps on the next page do to. When we removed the face plate on the final step, one of the corner brackets broke & remained in the corner. What do we do now? I have tried to gently force the broken piece out but it will not budge. I am afraid I will mess something up when I reassemble the new face plate. The one side with the broken corner will not align to reattach. Help please???? Try the best you can to get that bracket out. Just don't break anything else in the process. Worst case scenario, if there's just no way at all to get that bracket out (say the screw head is stripped and you're not comfortable or don't have the tools to safely drill it out), you can CAREFULLY break the tab off the new plate. It's a... "not quite completely professional" solution, but if it's your phone, and you're not regularly prying at that corner for some reason, the other brackets should hold the face plate on more than sufficiently. Exciting and challenging repair. Successful repair. Happy camper here. Thanks!! What happens now? is it the reason the phone wont turn back on? Someone else dis-assembled it before me and lost it... not sure if its the reason why it wont turn back on, also the last screw in the top right corner (near headphone jack was stripped in first attempt... what do I do? I just did this today, turned my iPhone on and to my relief everything is working great... except one problem. The backlight is flashing, very subtly... anyone know why this might be and what I could do to fix it? Super great guide! Was able to to replace front and back with just the complications of itty bitty screws being an issue haha but had shattered both sides! It's also blue now:-) thank you so very much for sharing this! Only advice I could offer is it's very teetious so try to avoid doing it with your young kids around haha. So I have a question before I put in the logic board. What do I do with the digitizer if it does not reach its socket? I don't want to pull it and damage it. The cable is folded up under the new display, take it off and look carefully as you put the cables through the hole. Guide them through. You may have to push digitizer cable to the right a little and watch it from the side until the new display is completely touching the front of the phone. If you pull the cable it will rip it in half then you have to buy another display! There are other posts about this issue. This happened to me with my first phone repair, an iPhone 4s. Also posts in guide for the ATT 4s display guide! Thanks for the great guide! 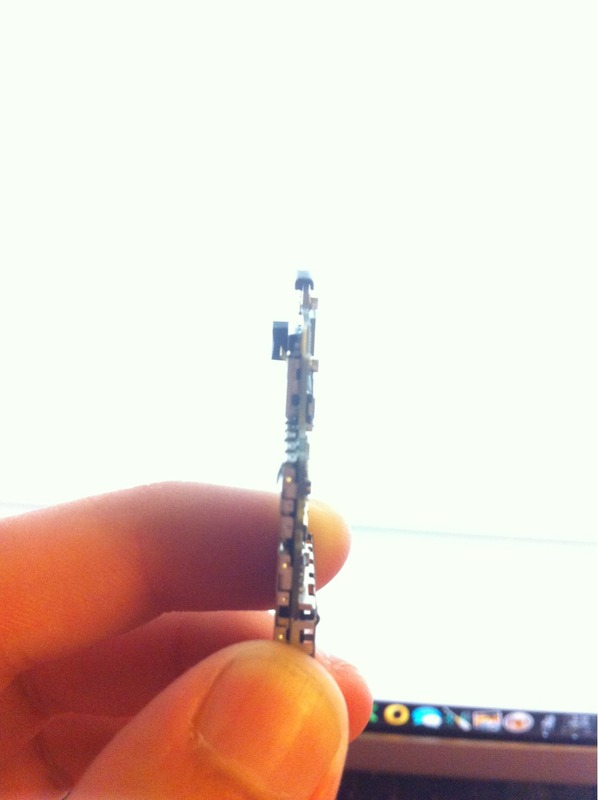 One issue I had, the #00 Philips screw driver was too big for most of the screws on the phone. I ordered the #000 from ifixit, and had no real issues after that. Thanks for the support! My Verizon phone is an A1349, but they say it is 8GB. Is this compatible with the 16 and 32GB instructions here, or is it an unrepairable knock off ? Thanks. I just repaired a fellow coworker's phone. I have repaired several iPhone 4s models. So this phone had a colored piece on top of the home button that my coworker attached to match her phone cover. When I was replacing the display I could not get this colored piece off. I have put the phone back together and everything works correctly except for the home button! Any suggestions? I did not rip the cable that is attached to the home button! I need help! lol. I put everything back together. It powers up and I can use functions and apps. However, I tried to sync or charge it and it doesn't recognize the cable being plugged into the port. Any suggestions? To stay organized I wrote the step numbers on white paper and stuck loops of Scotch tape beside the numbers to hold the tiny screws and parts. This kept everything in order and kept screws still. You can magnetize any tool easily by taking a magnet and swiping it down the shaft of the screwdriver. Put magnet at the midpoint of the shaft and swipe it downward. One direction only. Followed all directions, screen lights up. But will not respond to my touch. What did I do wrong? I am having the same problem. Followed all steps and it lights up but will not respond to touch. Please help! 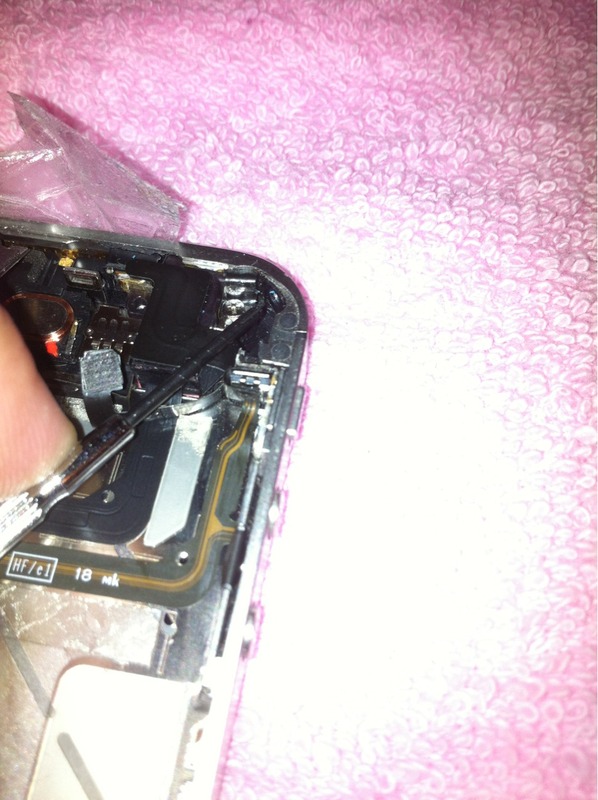 My daughter Samantha Lionheart is the living prof that a woman can repair a screen on an i-phone. It was pretty amazing to watch her do it. She was very patient, well organized(paper on hand to write her own reminder of which or where those tiny screws go back after 36 steps of instructions (tuff one). You have to be a smart cookie ! Congratulation !! my phone looks brand new now. Completed all the steps, but when I attempted to turn phone on after, it didn't work. Any suggestions for trouble shooting the issue? I think it might be the screen connector, but not sure. Thanks, first display was a LEMON (from China) white display with a few pixel top and bottom. Ordered from IFIXIT (inspected and tested) before shipping to customer. Could have save myself a couple weeks of none usage of my iPHONE. Read comments first before you start, they are very helpful. Thank you so much for this "Do It Yourself" instruction. It was difficult, but not impossible (a few rubber spacers here and there). Tools that were needed came with the front screen from "Zeetron". Great pictures to go back to for a visual help. If this guide was on paper it would be worn out by me. I have gotten accustom to the repair but this guide is a great check list. Mr. Andrew Bookholt, I want to thank you for your time, effort, and for sharing with the world this repair guide. My hat is off to you!!! Everything works great EXCEPT the bottom row of apps that don't move ( phone book Safari etc). Any suggestions. Suggestion - Remove SIM card around Steps 21-23. Well done! Could I use this display on an iPhone 4s? Help! I put everything back together but I still have a little clip! Maybe a cable cover or connector? I have the two ground clips mentioned back in place. But where did this little piece come from? It's black and gold with a little right angle in it. Which step did this piece come from?? You can see it in Step 17, it’s a grounding clip from the logic board. THIS MISSES A VITAL STEP IN NEWER VERSIONS OF THE VERIZON 4!! The flip release on the home button cable NEEDS to be opened and released BEFORE removing the screen. Because I didn't see what the flip release was connected to, I ended up ripping the flex cable in half when I pried off the front display. I'm not a happy lady, I'll say that. Sorry to hear that. As far as I know, there’s no newer version of this iPhone—the home button simply stays behind when the display comes off, although you may need to give it a nudge if yours is stuck or frozen for some reason. There should be no need to disconnect the cable. There’s a clear warning about this in the last step, but I added an additional warning earlier in the guide so it’s harder to miss. 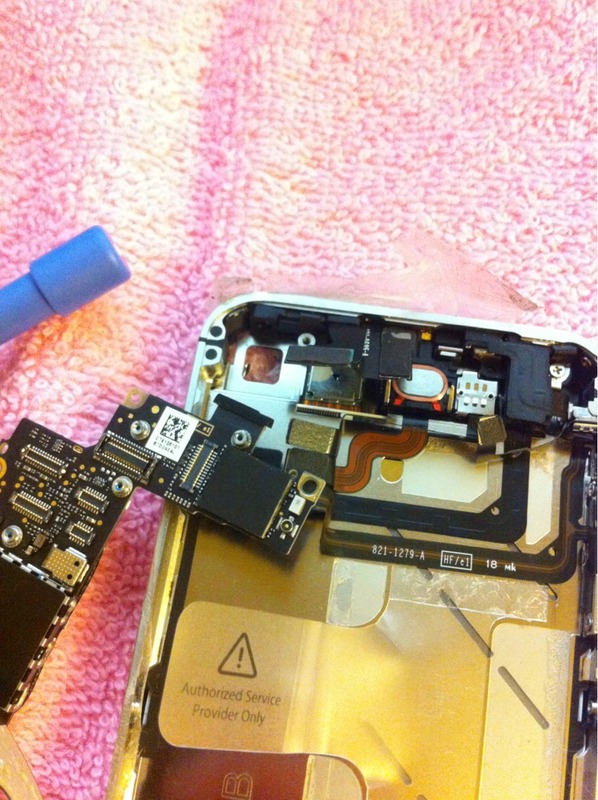 If it’s any consolation, the home button + cable is pretty easy to replace at this stage of disassembly. Better luck on your next repair!